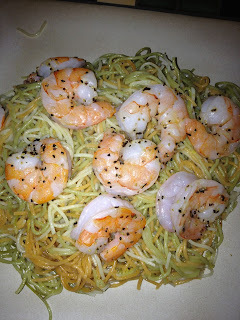 Meanwhile, drizzle some olive oil in a large pot of boiling salted water, add the angel hair, and cook about 3 minutes. Drain the pasta, reserving some of the cooking liquid. Quickly toss the angel hair with the melted butter spread, 1/4 cup olive oil, the lemon zest, lemon juice, 2 teaspoons sea salt, 1 teaspoon pepper and about 1/2 cup of the reserved cooking liquid. Add the shrimp and serve hot.